Fine boxes can be created in both solid hardwoods and natural hardwood veneers, depending upon the requirements of the design. Veneers are very thin slices of hardwood usually thinner than 3mm. They are typically glued on to solid hardwood, or a substrate of good quality hardwood ply or medium density fibre board. The finest and rarest timbers are normally converted to veneer, this increases the availability of the most desirable timbers. Converting timber maximises the use of a tree and reduces waste so is more environmentally sound. All wood moves to a degree with changes in humidity, this can affect the types of construction possible in solid timber. Curved work is particularly suited to laminating and veneering. Certain patterns and details can only be constructed with veneers such as a traditional sunburst. Certain timbers, especially some burrs, are impossible to work with in solid as they will fall apart. Veneering is an ancient art going back to the early Egyptians who used sawn veneers on their furniture. Nowadays, veneers are cut by slicing or unpeeling logs. Each method produces different grain effects from the same type of timber. Interesting patterns can be achieved with veneers by decoratively matching them in various ways: book matching (similar to opening the veneer leaves as one would open a book), slip matching (keeping the leaves with the same face up), radial matching (leaves are chosen in book or slip matching and then cut into wedges and joined). There are many types of match available including starburst effects which you may have seen on more exquisite tables. On the left is an example of book matched American Black Walnut, folded on the sap (lighter) side of the veneer. Parquetry is the art of making repeating geometric patterns with wood, for which veneers are particularly suitable. An example would be a wooden chess board. Marquetry is the art of making pictures with wood, again veneers are particularly suitable for this. Some of the marquetry that I undertake is to produce a client’s initials set within the lid of their box. 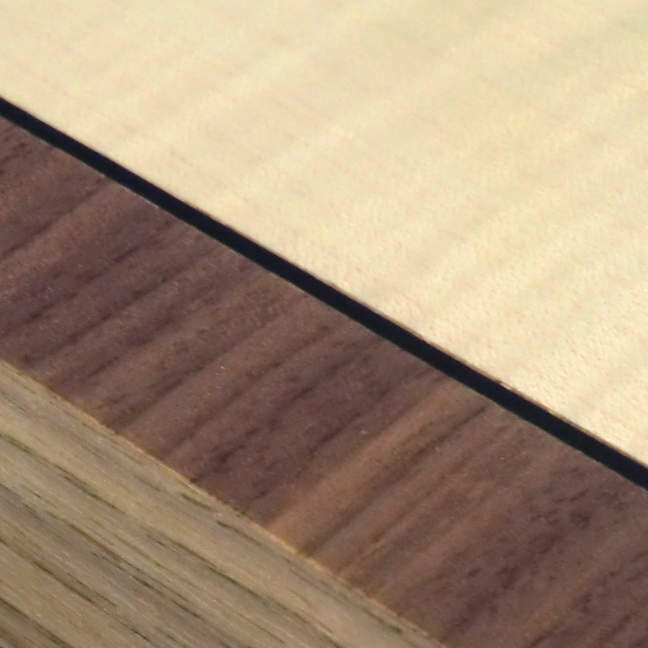 Cross banding uses veneer to create a wide border effect around the edge of furniture at 90 degrees to the general grain pattern. Stringing demarcates two areas of veneer and involves inlaying a thin string of veneer. Layers of coloured veneers can be joined to create strings and wider inlays vith variously designed patterns. It is striking to realise that most of the world’s greatest treasures of furniture are veneered. You can see many examples in the V&A Museum in London, the Smithsonian in Washington D.C., the State Hermitage in St. Petersburg and in others of the best museums around the world. Below is a list of exotic hardwood veneers that I can work with to produce a fine handmade box. Please note that the colours and grain patterns are representative of the veneers, as this is an organic material there will be differences in the selected veneers.